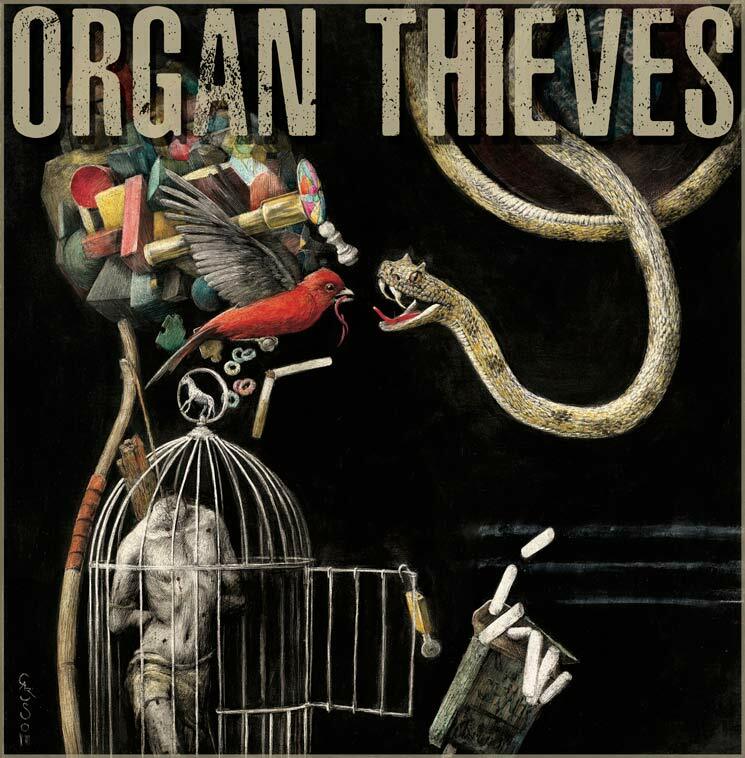 Organ Thieves will finally unleash their self-titled sophomore album on January 1 — over five years after its November 2013 completion. The quartet, which features Dave "Brownsound" Baksh of Sum 41 and Chuck Coles of the Creepshow, will be celebrating the release with a New Year's Eve bash, but they're giving the public a tease via this three-song sampler. Before we get to the songs, we've got to clarify why the follow-up to 2012's Somewhere Between Free Men and Slaves took so long to come out. Well, Coles joined the the aforementioned Canadian psychobilly mainstays the same year they finished work on this album, while Baksh rejoined his pop-punk alma mater two years later in 2015. There was also the typical record label drama, but the band are now free of any corporate ties and, as such, are free to donate proceeds from it to Story Book Farm Primate Sanctuary. Hopefully, those monkeys like rootsy rock, since the Organ Thieves manage to bring Springsteen-esque vibes into their punk rock, similar to the Gaslight Anthem or Coles' one-time collaborator Chuck Ragan and his band Hot Water Music. At least that's the case on "Ain't No Love" and "So What (Let It Go)," though the sampler's final track "Honest Eyes" is a bit harder rocking; it's almost as if the band leaders were splitting the difference between this sound and the heavy metal leanings of previous project, Brown Brigade. That duo and their old lineup had some help recording this release, with the Bouncing Souls founder Pete Steinkopf co-producing with Coles and backing vocals courtesy of Daves Hause (the Loved Ones) and Walsh (the Explosion). You can hear the results in the player below and clear your schedule on NYE if you like what you hear. After all, those primates (yes, that includes storied IKEA monkey Darwin) could use the funds. Get the details of that NYE show here.